<------- NEW! Please click "CUSTOMER COMMENTS" (left side of page) where I have listed a few of the generous comments I've received. <----------------------CLICK on category of your choice to find children, lady and men dolls. << -- Click on this viola flower to see my eBay auctions (if any). << -- Click on the viola flower to see my Etsy listings. 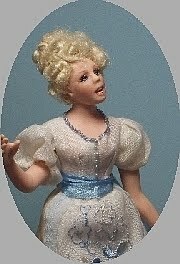 To see my other doll-related items, look under "More Minis" and click on the item of interest. To learn about me, click on ABOUT THE ARTIST.